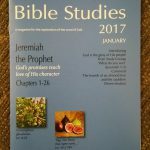 For the past century, the results of monthly studies by many different groups all focusing on the same portion of the Bible at the same time, have been documented and published as Bible Studies Magazine (see the sample magazine cover below). A variety of views on different Scriptures and topics usually emerges and editors have when necessary added a few comments to keep everyone on track. You can check the index there and choose to research a specific Bible book or topic. After you’ve tried it, by all means leave a comment here. And if you find it useful, do share the link with your Bible-studying friends!